The effect is straight forward. Show a few tictacs on your hand and an empty tictacs box. Slam the container on your hand and make all tictacs jump into the container. 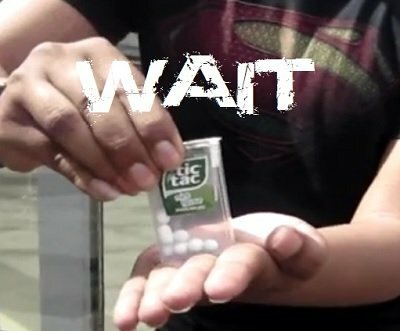 Your hand is empty and the container filled with tictacs. If somebody would have counted the number of tictacs in the container is exactly the same as there were on the hand. You can handout the container with the tictacs for inspection or even as a gift.